911, your child’s favorite book just suffered a torn page! What to do? Place it in the book ambulance so that it can be taken to the book hospital for repair! As a classroom teacher, I found many of our classroom library books suffered from wear and tear. As a parent, I’m discovering the same thing at home. When these books were just placed back on the shelf, they were destined to further deterioration. So, I created the book ambulance. 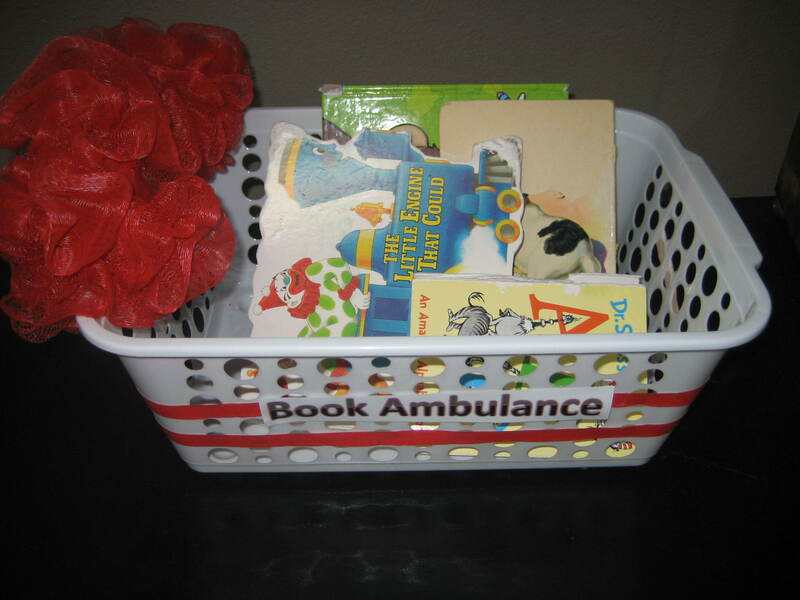 When a child found a book in need of repair, they placed it in the book ambulance. Then, when time permitted, I took the books to the book hospital (usually my kitchen table) to be repaired. Utilizing the book ambulance helps to teach kids to respect books. Classroom teachers can keep track of the number of books that are put in the ambulance each week to compare how well the books are being cared for in the room. Children learn that books aren’t just things, but rather important gifts that should be treasured. Making your own book ambulance is super simple. You will need the following materials: 1 white, red, or yellow rectangle basket, 2 red nylon shower sponges (I found mine in the $1 bin at Target and cut them in half. ), string, red masking tape or ribbon, book ambulance sign (I made mine using Wordart in Word.) scissors, and tape. Attach the sponges to the basket with string to make the sirens. 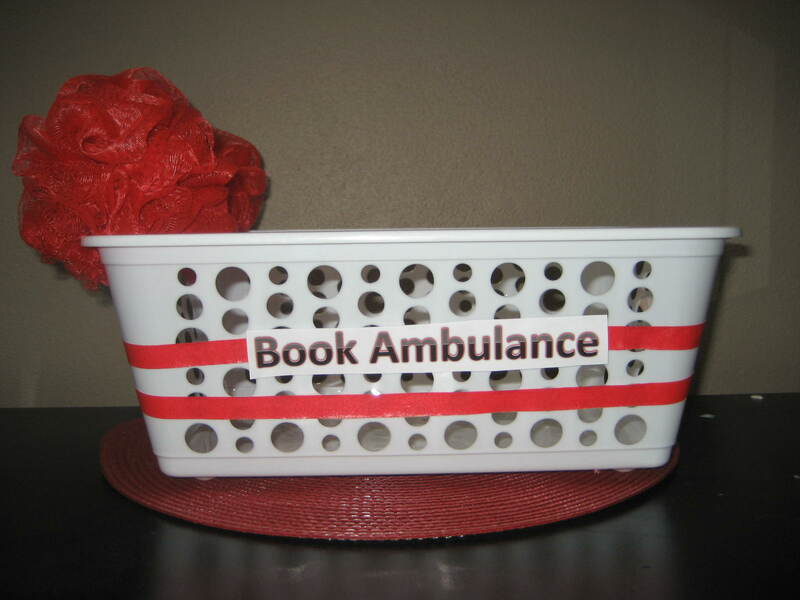 Tape your book ambulance sign to the side of the basket and then decorate with red masking tape or ribbon. For about $2, you’ve just created your book ambulance. Now, off to the hospital. And what “medical” supplies does your book doctor bag need to include? Here are the tools that I’ve found to be the most helpful. Duck Brand Clear Packing Tape – I’ve found that this brand works the best for repairing long tears on pages and for reinforcing the binding of a book. Transparent Tape- 3/4″ works well for small tears on pages. Place tape on both sides of the tear for extra durability. Long Handle Stapler- This can be a pricey tool, but works very well for pages that have come loose in staple bound books. You generally find that the books ordered from book clubs like Scholastic or Troll have staple binding. Eraser- Takes stray pencil marks that little ones may have made on pages. Drying Rack- This won’t fit in your book doctor bag, but it sure does come in handy when a book falls into the bathtub. Fan the pages out over the drying rack and allow to air dry. You now are equipped for those book emergencies. Having a few tools on hand can rescue many of your beloved books from retirement. Of course, we know that some book accidents are beyond repair. Never fear, in a future post, we will look at other uses for books that are beyond fixing. Happy book doctoring! Very creative idea. First time I’ve seen this idea. Great idea….after teaching K kids for 32 years, I have a number of classroom books that need to see the doctor on a regular basis! 🙂 Thanks for the inspiration! Love this post and idea! One it is a great organization tool, second I love the way it reinforces respect for books. This is such an AWESOME idea! I’m going to pin it….what a great way to teach responsibility in a fun way (and save a book or two!). Thanks so much for linking up at Thrifty Thursday! I hope you had an amazing new year! What a great idea! My kids always show me damaged books at times when I’m not ready to deal with them, and sure enough, they get put back on the shelf where they suffer even further damage. Thanks for sharing! Cool idea. coming from Teach me Tuesday. My books are always in need of a ambulance. Thanks to my 2 year old loving them to death. This is wonderful! It could certainly save a few books around here! I love how it ties into an Emergency theme too! Thanks so much for linking up at Teach Me Tuesday!! Super cute idea!! I wanted to invite you to link up at TGIF kid oriented Linky Party – http://livinglifeintentionally.blogspot.com/search/label/Linkey%20Parties -I know my readers would love it too!